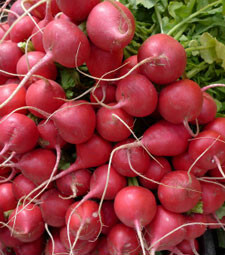 Easter Radishes: Related to the turnip and horseradish family, with a crisp texture and a peppery -hot flavor. This radish gets its name from the size and colors of the radishes. Store without the leafy tops and place in the refrigerator, wrapped in plastic to keep fresh for several days. 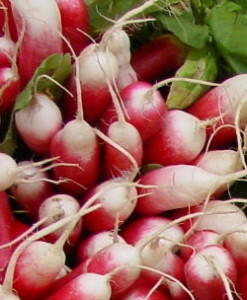 French Breakfast Radishes: The French Breakfast radish or Flambo radish, has an elongated shape that can grow to approximately three inches in length, displaying a bright red outer skin, which turns white at the root base. It is a radish with a crisp texture and a mild to delicately sweet flavor that is generally served raw to be used as hors d’oeuvres or a compliment to salads. 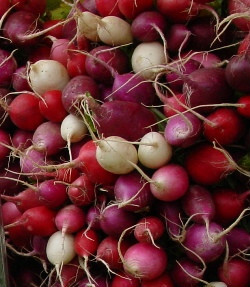 Red Radishes: Radishes are rich in ascorbic acid, folic acid, and potassium. They have vitamin B6, riboflavin, magnesium, copper, and calcium as well. One cup of sliced red radishes provides approximately 20 calories or less, making radishes, relative to their size, a very filling food for their caloric value. 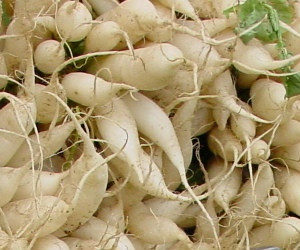 White Icicle Radishes: This variety is long, up to a half foot, and tapered. They have a white flesh that is milder than the red variety. 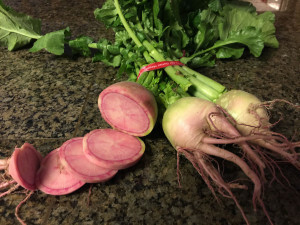 Watermelon Radishes: Watermelon radish flesh is white closest to the exterior and becomes bright, circular with striations of pink and magenta toward the center. Its flavor is generally milder, only slightly peppery with some sweet notes.